Tech Transformation: Have a nice day ... or else! Have a nice day ... or else! This morning I read a great post by Alfie Kohn about looking at what is on the walls of a classroom. Please follow the link and read the whole article, below are just a few of my reflections on reading it. Kids don’t require a classroom that’s relentlessly upbeat; they require a place where they’ll feel safe to express whatever they’re feeling, even if at the moment that happens to be sad or angry or scared. They need a place, in other words, where negativity is allowed. Bad feelings don’t vanish in an environment of mandatory cheer -- they just get swept under the rug where people end up tripping over them, so to speak. What you or I may describe as a negative attitude, meanwhile, may be an entirely appropriate response to an unfair rule, an intimidating climate, or a task that seems pointless or impossible. To exclude such responses from students is to refuse to think seriously about what may have given rise to their negativity. ... this status, like so much else in our schools and our society, is set up as a zero-sum game. If I become the valedictorian, then you can’t – and vice versa. In a competitive environment, our dreams are mutually exclusive. All else being close to equal, I‘d be thrilled to send my children to a school whose walls featured variations on the timeless reminder to “Question authority.” And imagine if the principal’s office contained a framed print-out of this reminder from researcher Linda McNeil: “Measurable outcomes may be the least significant results of learning.” Visitors would be reassured that such an administrator understood a lot more about education than do most politicians. Alfie says the best classrooms are those that feature material created by the students themselves and the important question is not just what goes on the walls, but who decides what goes on the walls. 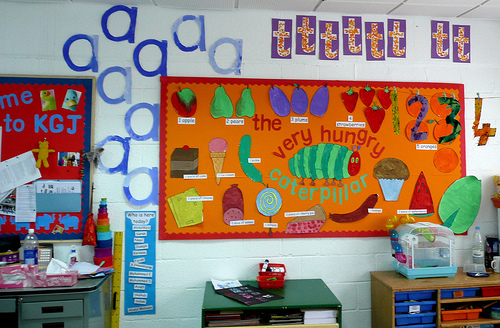 Tomorrow I'm going to go and have a really good look at the walls in my classrooms and ask myself what message are my displays sending. Teachers don't really stop and think critically about the message that their classroom design sends but it does send a message. This is a great reflective exercise that I hope that more teachers will do.